ISLAMABAD, May 6 (APP):The European Union member states in Pakistan celebrated Europe Day again in a unique manner, in light with the 2018 European Year of Cultural Heritage. A “EuroVillage” was set up in Pakistan National Council of the Arts (PNCA), aiming at promoting the European culture and values. Federal Minister for Capital Administration and Development Division (CADD), Dr Tariq Fazal Chaudhry was the chief guest in the opening ceremony of one-day event. Federal Minister for Postal Service Maulana Ameer Zaman Bukhari also attended the ceremony. Addressing the participants, the Minister said that Pakistan’s relations with EU were very cordial. He lauded the role of European Union for organizing a Eurovillage in Pakistan for the second time. He said that such events would strengthen relations between the Member States of EU and Pakistan. 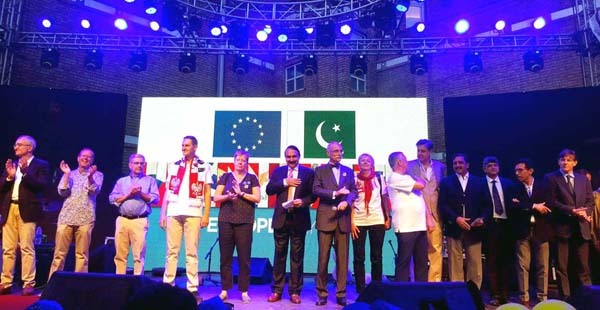 In his welcome address, Ambassador of the European Union to Pakistan Jean Francois Cautain recalled that the reason the EU was organizing a EuroVillage with participation from the member States was “to remind everyone of the EU’s cultural richness while also underlining our unity”. The Ambassador affirmed that “the European Union is, and will continue to be a strong, cooperative and reliable partner to Pakistan. We stand for multilateralism, for human rights, and for international cooperation. We work at home and abroad to promote sustainable development, inclusive societies, and the fight against inequality of any type. The visitors were provided with multiple displays of Europe as a culturally rich and friendly place. The EU’s as well as the Member States’ stands showcased the countries’ culture and traditions, languages, food and music to Pakistan’s general public as well as general information about the EU and the EU Member States. The premises of PNCA were transformed into a genuine carnival with stalls with European typical food. There were information and activity booths for adults and children including quizzes, selfie walls and giant cut outs of famous landmarks in Europe. The evening ended with live performances of the European bands Lohninger and Fischbacher Duo, Wild ManGoes, Hun Solo and the Pakistani artist Zeb Bangash. A famous European illusionist Charlie Caper also enthralled the audience with his performance. The partnership between the European Union and Pakistan has progressed since 1962 in tandem with the European integration process. In order to further strengthen EU-Pakistan relations the two sides in 2012 adopted a 5-year engagement plan with the common goal of building a strategic partnership for peace and development rooted in shared values, principles and commitments. The EU-Pakistan 5-year engagement plan came to an end in 2017 and the two sides are now aiming at endorsing a new strategic framework for partnership and cooperation that can guide relations aiming, at further strengthening the already strong ties between the peoples of the EU and of Pakistan.